Coquillage - Dictionnaire Visuel - Copyright © 2005-2016 - Tous droits réservés. 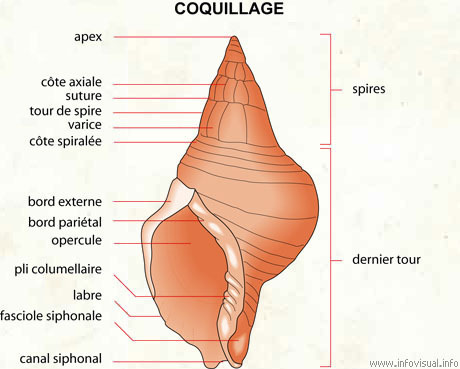 [img]https://infovisual.info//storage/app/media/02/img_fr/010 Coquillage.jpg[/img] [url=https://infovisual.info/fr][/url] - [url=http://www.infovisual.info/]Dictionnaire Visuel[/url] - Copyright © 2005-2016 - Tous droits réservés. Spires: partie enroulée de la carapace. Canal siphonal: tube du coquillage servant à siphonner. Fasciole siphonale: bande spirale du canal siphonal. Pli columellaire: limite du canal siphonal. Opercule: partie calcifiée avec laquelle le coquillage peut fermer sa coquille. Bord pariétal: bord situé sur le côté de la cavité du coquillage. Bord externe: bord situé sur le côté opposé à la cavité. Côte spiralée: partie du coquillage enroulée sur elle-même. Varice: sculpture axiale au sommet arrondi. Tour de spire: structure de la carapace. Suture: joint entre deux tours de spire. Côte axiale: partie du coquillage relative à l'axe. A seashell, also known as a sea shell, is the common name for a hard, protective outer layer, a shell, or in some cases a "test", that was created by a sea creature, a marine organism. The shell is part of the body of a marine animal, in most cases the exoskeleton, usually that of an animal without a backbone, an invertebrate. The word seashell is often used to refer only to the shells of marine mollusks, i.e. mollusk shells, but it can also be used to mean the shells of a wide variety of marine animals from different phyla. For helpful introductory articles, see marine invertebrates and marine biology. Seashells are commonly found in beach drift, natural detritus deposited along strandlines on beaches by the waves and the tides. Shells are very often washed up onto a beach empty and clean, the animal having already died, and the soft parts having rotted away or having been eaten by either predators or scavengers. Empty seashells are often found by beachcombers, and collecting these shells is a harmless hobby or study. However, the majority of seashells which are offered for sale commercially have been collected alive and then killed and cleaned, specifically for the commercial trade. This type of exploitation can sometimes have a strong negative impact on the distribution of rarer species, and on local ecosystems. Many other kinds of sea animals have exoskeletons or shells which may, after death, wash up on the beach and may be picked up by beachcombers; these include remains from species in other invertebrate phyla, such as the moulted shells or exuviae of crabs and lobsters, the shells of barnacles, horseshoe crab shells, sea urchin and sand dollar tests, brachiopod shells, and the shells of marine annelid worms in the family Serpulidae, which create calcareous tubes. When the word "seashells" is used to mean only the shells of marine molluscs, (spelled "mollusks" in the USA), then studying seashells is part of conchology. If studying the whole molluscan animal is included, then the study is known as malacology; a person who studies mollusks is known as a malacologist. Seashells have been used by humans for many different purposes throughout history and pre-history. The word "seashells" is often used to mean only the shells of marine mollusks: bivalves (or clams), gastropods (or snails), tusk shells or scaphopods and chitons or polyplacophorans. These are the kind of seashells which are perhaps the most familiar, and are very often the most commonly encountered, both in the wild and for sale as decorative objects. Not all molluscs are marine: there are numerous land and freshwater molluscs, see for example snail and freshwater bivalves. Not all mollusks have an external shell: some have an internal shell, and some have no shell, see slug.